This entry was posted in Going Green, Making, Creating + Frugal Living and tagged christmas, eco gift ideas, gift tags, green, homemade, my creative space, recycling, upcycling by cityhippyfarmgirl. Bookmark the permalink. My packaging isn’t nearly as smart, but I was planning to give away a couple of jars of the tomato chutney I made last summer as Christmas presents. the stamps are new and I’m already loving them to bits. Hopefully there are quite a few more tags to come from them. And I’ll bet any of your homemade goodies will be greatly appreciated Richard. They are great little stamps aren’t they. Your preserves, I’ll bet they will be loved by all who receive them Kathy. What beautiful packaging and such thoughtful and tasty gifts. We are making salt dough Christmas decorations. I’ve made Christmas chutney and topped the jars with photocopied Christmas carol music scores and some red crochet ribbon. 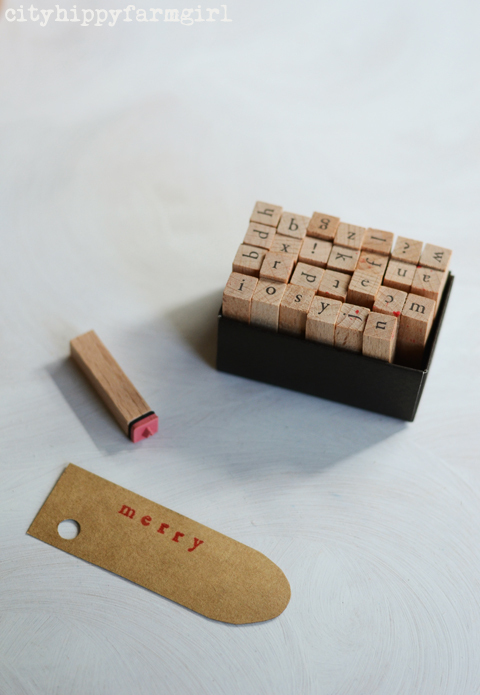 Love your stamps….might have to treat myself!! That is a rockin’ idea Sarah. That would look rather awesome! They all sound fantastic. I love hearing about the homemade goodies others are making (or planning) to give. Wonderful. They’re going to love it! 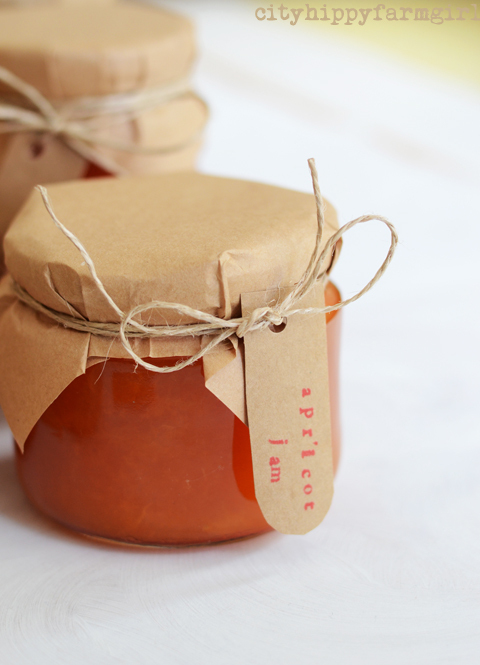 It’s been years since I made apricot jam, so it’s been good to line the shelves again with apricotty-ness. I love your packaging Brydie, it is perfect. I have made hundreds of mini gingerbread men which I will be giving to everyone at Christmas time. I do love a homemade gift and thoughtful, creative packaging. So much nicer than the generic/supermarket Christmas stuff. *sigh* so much nicer isn’t it Jane. It can be lots of hard work but I never regret it afterwards. I’m giving knitting needles and yarn along with lessons to one family, knitted fingerless gloves to my sister, caramel corn to my neighbors, cinnamon rolls to my little old lady friends, frozen quiche and muffins to my nieces, bread bears, angel rolls, and yeasty dinner rolls to my family and trays of cookies to anyone else who comes by with a gift. And toys- lots of toys for my little boys! That apricot jam sure looks great! I’m going to buy some to put into the cookies I’m making on Friday! That sounds all rather fabulous dear Heidi! They were very soothing Kari, I’m actually looking forward to doing it all again tonight. Oh sheesh! I know how very bloody real this threat is. Good luck, and may your hands be swift and ache free. It’s not it really isn’t. Fruit- not too ripe, sugar same amount as the fruit, water- depends on the fruit but roughly half the weight of the fruit and cook it up. You make it sound easy! Challenge accepted! They certainly have been for the last few years haven’t they. I think there have been a few consecutive bad growing seasons. These little fellas, while not super duper cheap have been definitely doable though- I’m three batches in! I’ve got similar stamps to these and I love them! I need to do some wrapping, cutting and stamping my self today. Oh eek! I’m loving them! what a lovely gift brydie..the recipients will be very lucky to receive your jars of jam..they represent so much hard work, thought and creativity.. I hope they like them Jane…more exciting than a box of Lindt balls I hope. Did the apricots come from your own tree? I’ve just moved house last week and found I am blessed with a lemon tree and two apricot trees… but the apricot trees seem to be a bit sick, there’s no fruit and the leaves look a bit yukky… any thoughts? Last year I baked up a storm, this year, I’m afraid all I managed were a few chocolates! Next year…apricot jam and lemon curd! Not sure about your trees but how wonderful is that to have established trees! Hope you can find what sort of love they need and for them to be fruiting a plenty for you next year. How beautiful. We have hand made goat milk soap in little gift bags. It seems that hand made is catching, you think your teenage kids think you are not cool , then you catch them making hand made gifts just like you .- JB made bottle openers with a nail and a piece of wood and G made funky head bands. 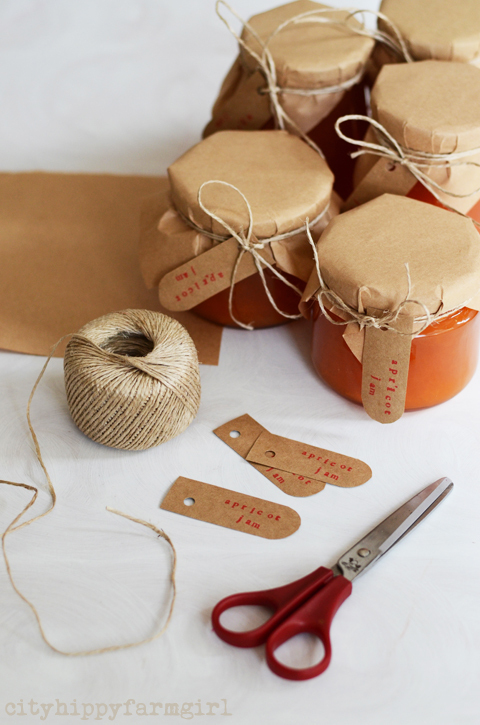 Brown paper, string & made with love…these are a few of my favourite things. These are adorable! I love them! I have some jars that would be perfect for these! Thanks for the idea!